Location, Blouberg, West Coast, Job Type Full-Time. Experimax Table Bay is looking for young dynamic & enthusiastic sales persons preferably with technical acumen, a passion ...SALARY AND BENEFITS WILL BE DISCUSSED UPON INTERVIEW. The standard deviation of salaries for the results of this search is 154,390. There are 43 Sales Person job vacancies in Cape Town City Centre available immediately, compared to 5 in Bellville. 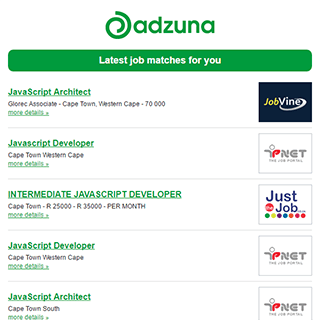 The Adzuna recency index score for this search is 1.87, suggesting that demand for Sales Person job vacancies in Cape Town City Centre is increasing. The largest category under which open Sales Person jobs are listed is Sales Jobs, followed by Admin Jobs. Get the latest Sales Person Jobs in Cape Town City Centre delivered straight to your inbox!